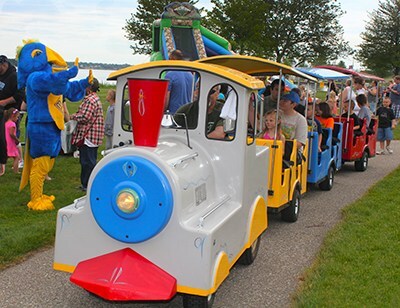 The Third Annual MCC Community Family Fest returns to the Muskegon Lake shoreline on Saturday, June 2, 2018 when residents of all ages can enjoy fun and educational activities. The event, which is free and open to the public, runs from noon to 3 p.m. at the MCC Lakeshore Fitness Center, 900 W. Western Ave., in Muskegon. Among the fun activities scheduled for the youngsters are bouncy houses, train rides, face painting, make-and-take crafts, games, chalk art, karate demonstrations, gaga ball, and much more. The whole family can participate in fitness center tours, obstacle courses, family-friendly Pilates and Zumba exercises, a Fit Walk, fowling – which combines football and bowling, cardio-pound drumming, hula hoops, fun photos, a human knot, onsite body scans, soccer, and meet with Jay, the MCC Jayhawk mascot. Visitors can visit the various booths for a chance to win prizes. There will be a picnic with free food and music. A MCC motor coach will transport visitors to the college’s new Sturrus Technology Center to experience the Lakeshore Fab Lab Open House.